Murillo Modular has installed hundreds of thousands of square feet of quality modular structures. 1. Project Histories: Users can view photos and descriptions of the various projects Murillo Modular has completed. 2. Meet Our Home Team: Names and role descriptions are provided for the management team. 3. Staff & Current Client Portal: Employees and Clients can log in to view project statuses and related documents. 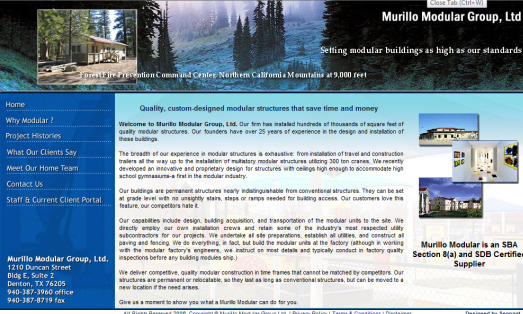 Segnant has helped make MurilloModular.com an informative yet attractive site for users seeking modular structures.